Beck hurt his arm when a "little robot door closed on me." As I understand, he did not play guitar tonight. Not clear if he only sang, or if he did keyboards or something. Doesn't seem to have affected his mood though. "We love the Nagoyans," Beck announces. "We're gonna engage in some Nagoyistic activies this evening." "Think I'm In Love" was dedicated to some girls who gave him flowers. "Packaged fruit and potpourri" are other acceptable gifts. A long, mellow "Nicotine & Gravy" was dedicated to a steakhouse in Japan. 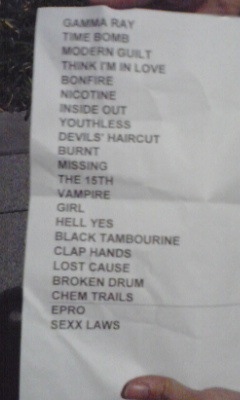 My favorite things on this show: "Nicotine," "The 15th," "Vampire Voltage," "Burnt Orange Peel." Also the "Lost Cause," "Broken Drum," "Chemtrails" heavy psychedelic trippy trilogy. Live debut of "Vampire Voltage." First "Burnt Orange Peel" in 8 years (though Beck says it's the first time in 15 years).